Ayrshire includes the local authority areas of North Ayrshire, South Ayrshire and East Ayrshire. For accommodation in the area see the links in the "See and Stay" menu above. See the map below for an outline of the area and links to surrounding areas. The eastern shores of the Firth of Clyde mark the meeting of two very different worlds. 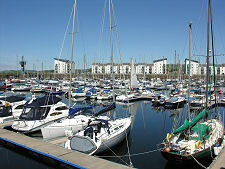 Harbours, seaside resorts and golf courses line a coast whose hinterland includes the industrial heartland of Ayrshire and the southern fringes of Glasgow. Yet the settlements on this coast seem determined to face seawards rather than landwards. This may be because they share one truly defining characteristic: stunning views west to the magnificent mountain scenery of the Isle of Arran. At Troon all the different elements of this coastline come together in one place. 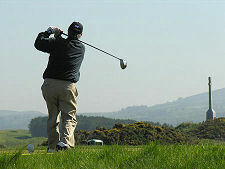 The town is best know for the Royal Troon Golf Club. Troon also offers the sandy beaches of a traditional holiday resort; a busy and long established commercial port; a fast catamaran ferry crossing to Belfast; and a large and active marina for leisure craft of all sizes. Troon really does have something for everyone: but being surrounded by six golf courses, it really excels in what it offers for the golfer. A little inland are the striking ruins of Dundonald Castle. Further along the broad sandy sweep of Irvine Bay you come to the mouth of the River Irvine. Half a mile inland along the river lies Irvine, home to the Scottish Maritime Museum located at various sites across the beautifully redeveloped Irvine Harbourside. Not quite connected to Irvine is Kilwinning, with the remains of the magnificent Kilwinning Abbey. This in turn runs into Stevenson, Saltcoats and Ardrossan, the latter the terminus for the Arran ferry and home to the ruins of Ardrossan Castle. North again and the settlements become slightly more scattered as the inland hills are higher and closer to the coast, though Dalry and Beith both stand on the main A737. On the coast near West Kilbride is the beautiful hamlet of Portencross, complete with Portencross Castle. 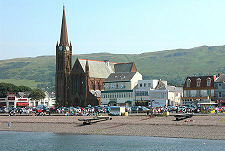 The first main settlement on this stretch of coast is Largs. Here you find the terminus for the ferry to the island of Great Cumbrae. 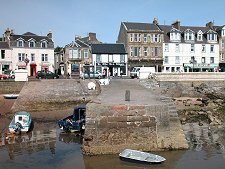 The island itself is well worth a visit, with its main town Millport being home to the Cathedral of the Isles and the restored Garrison House, which houses the Museum of the Cumbraes. Inland from the coast the biggest settlement is Kilmarnock, the centre of much of the area's industry. Kilmarnock lies at the meeting point of the A77, A71 and A76 main roads which link it respectively with Glasgow, Edinburgh and Dumfries, making it in many ways the focus for whole of Ayrshire. 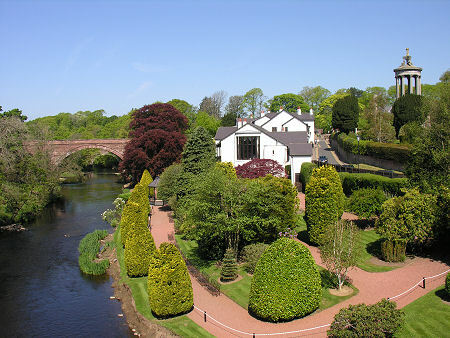 Following the A71 east from Kilmarnock takes you along the Irvine Valley and through the traditional centres of the lace industry in Ayrshire, Newmilns and Darvel. Roads north from Kilmarnock tend to lead eventually to the Clyde, with the relatively minor A735 taking you through Kilmaurs with its attractive and largely white harled centre, to Stewarton, the "bonnet toun". 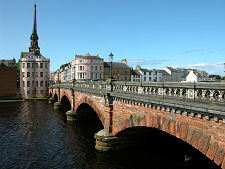 The largest town on the Firth of Clyde coast of Scotland is Ayr. It is an attractive town with a long history and for many centuries was the largest port anywhere on Scotland's west coast, only being overtaken by Glasgow in the 1600s. Today it retains an active harbour and is also home to one of Scotland's major racecourses, complete with the Scottish Grand National. The northern end of Ayr blends into Prestwick, possibly best known as the location of one of Scotland's three international airports. This is now known as Glasgow Prestwick International Airport to emphasise its road and rail links to Glasgow, though many locally (and beyond) would like to see it renamed to reflect the area's links with the poet Robert Burns. Nowadays virtually a southern suburb of Ayr, Alloway is the epicentre of these links. 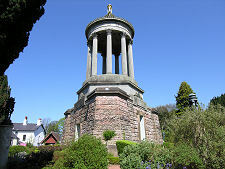 Here you find the magnificent Robert Burns Birthplace Museum, which acts as an umbrella for the other Burns related attractions in the village, including Burns Cottage; Burns Monument and Memorial Gardens; and Auld Kirk Alloway and the Brig o' Doon, which between them provided such a striking setting for his poem "Tam o' Shanter". The main A77 road south from Ayr takes you through Maybole, though a slightly lesser road, the A719, sticks closer to the Ayrshire coast. The A719 has many attractions. Travelling from south to north it passes Turnberry's famous golf courses and less well-known castle before going through the village of Maidens and skirting Culzean Country Park complete with the magnificent Culzean Castle. Meanwhile, on an unassuming hillside overlooking the sea, you find Electric Brae, where cars appear to roll uphill: an optical illusion, but a convincing one. A minor road nearby takes you even closer to the coast, through the pretty harbour village of Dunure and past the ruin of Dunure Castle. 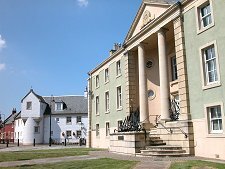 Maybole is the ancient capital of Carrick and, as Miniboll it has a recorded history going back to the 1100s. Today it lies astride the A77 and is home amongst other things to an active campaign for a bypass to ease the impact of through traffic on the narrow High Street. Two miles east of Maybole is Kirkmichael, another extremely pretty village. Further from the Clyde coast, the landscape becomes more post-industrial, although settlements like Cumnock, New Cumnock and Dalmellington still have their attractions. South of Maybole the main road passes by Crossraguel Abbey, one of the best preserved abbeys in Scotland, and one of its more unusual. It is certainly worth exploring. 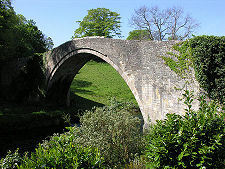 A little beyond is the attractive village of Kirkoswald, known for its range of connections with the poet Robert Burns and in particular for the restored Souter Johnnie's Cottage. At Turnberry the main A77 rejoins the coast road and heads south towards Girvan. 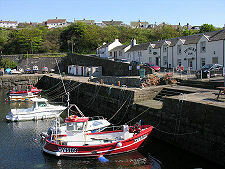 Here you find a substantial town with an even more substantial harbour, complete with boat building yards. It is perhaps best known as the point of embarkation for trips to Ailsa Craig, the remarkably shaped 1114ft high rock sitting offshore at the southern end of the Firth of Clyde. The most southerly settlement in Ayrshire is Ballantrae. Just south of Ballantrae is Glenapp Castle, a superb country house hotel. 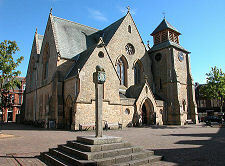 Driving Tours: Cumnock and New Cumnock are visited on our Lanark & Sanquhar Driving Tour.